I recently found the (pretty new) comic strip Wallace the Brave. Wallace is a kid who lives in the New England shore town of Snug Harbor. He’s another kid who pretty much goes barefoot all summer. In this strip from July 1, 2015, it’s time to go back to school. Trust him! He’ll be fine! I’m continuing to write about my trip Out West. Yesterday, I arrived at El Malpais and hiked the Sandstone Bluffs. I stayed at the (free) Joe Skeen Campground. The next day, Wednesday, August 10, I started just by exploring the area around the campground. That was great just by itself. I am off again on a trip Out West. I left early Monday, August 8 and arrived at my first destination Tuesday around noon. We’re getting close to back-to-school time. 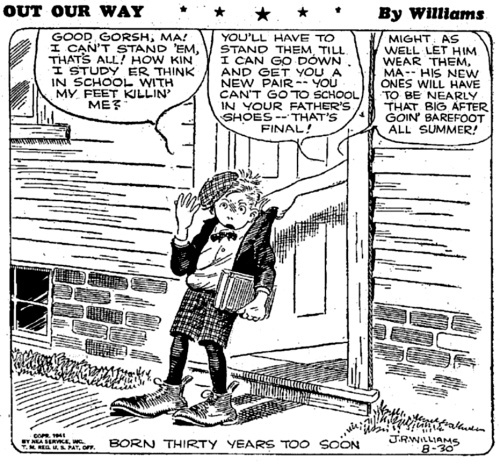 So here’s a comic from August 30, 1941. It’s from Out Our Way by J. R. Williams. And thus are pernicious barefoot myths started. Our comic for today comes from September 17, 1946 (and repeated on July 14, 1963). It’s from Out Our Way by J. R. Williams. Red and Rover is always a fun comic strip in the summer, since it portrays Red as a child of the 1960s, when kids spent much of their time barefoot. The joke here isn’t about bare feet, but the strip shows how nonchalantly bare feet were accepted.